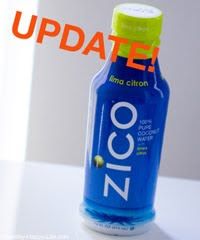 Coconut Water Update: ZICO Defends Brand Changes. But What's all the Fuss? It's "just coconut water" right? And the changes are so minimal, right? Yes and no. - The evaporation process in general is extremely high-tech these days and therefore there is little to no impact on nutritional profiles of the product. Also, because ZICO is using a unique process that completes the evaporation in a matter of seconds and at a lower temperature than normal processes, the heat-intensive processing step that she was concerned about does not come into play. This is what allows us to maintain the nutrition content and maintain the fresh, clean taste of the product. - There are cost savings in shipping (though that was not the primary goal), but the more environmentally friendly HDPE bottles also have a cost to them. Therefore we will continue to try to pass along whatever value we can to the consumer, while also doing our best to minimize the impact on the environment. *Though ZICO is made from concentrate that actually doesn’t change the all natural benefits of the product. The phrase “from concentrate” often has a questionable reputation. It really just means that the coconut water has had most of the water removed during the production process so that it could be more easily transported and stored. The water is then added back in, giving it the same nutritional breakdown as the original coconut water. ZICO does this to reduce production materials and resources, making it better for the environment. *The new ZICO tastes a little different, but this has nothing to do with concentrate or the packaging. For the new ZICO, coconuts are sourced from all over the world, while the carton uses only coconuts from Brazil . 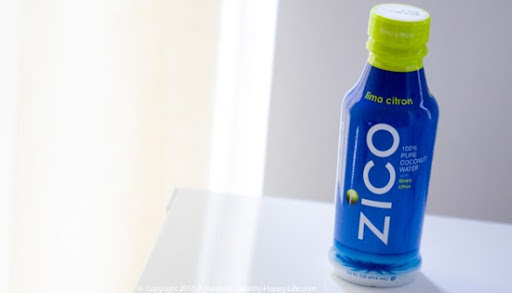 The blend of coconuts in the ZICO bottle was specially selected for a lighter taste, lower caloric content and increased sodium, which helps optimize hydration. If people prefer the original ZICO taste, they can buy ZICO in the carton. It’s merely a taste preference. *Both ZICO products contain five essential electrolytes, more potassium than a banana and zero fat, zero added sugar and zero cholesterol. *The plastic ZICO bottle is #2 recyclable, which is accepted in almost all curbside recycling programs nationwide. These bottles are recycled 40 times more often than the paper carton Tetra Paks. The bottles are also made domestically. *The Tetra Pak is not being discontinued. ZICO found that while many people love ZICO, they sometimes felt the Tetra Pak wasn’t shaped well to fit easily into their lifestyles. Since ZICO is such a great hydration drink for athletes and active people, the new bottle with the screw off cap makes it easier for people to carry it around, store it on a bike rack or toss it in their gym bag. I am thrilled to hear that the ZICO Tetra Pak formula is not being discontinued. I am a huge fan of the traditional Orange Peel Passion Fruit flavor - from the beginning, it has been my favorite flavor-essenced coconut water. In regards to the 'from concentrate' issue. I understand that the nutrients may still be equally accounted for when you compare fresh to 'from concentrate' coconut water. But by concentrating the coconut water, you have added another processing step. And an intense one at that. I have read that the process of pasteurization (something done to all brands of packaged coco water) is much less heat intense than the process of concentrating (removing the water from) coconut water - which is a very heat intense process. Do you have any comments on this? I ask because obviously the more you process a food - the farther the food strays from its original natural state. And when I shop for food I seek products that are minimally processed. I'd rather buy apples from my local farmers than from Whole Foods. Or buy soybeans and crush them into homemade veggie burgers than buy highly processed soymeat burgers. And I'd rather drink fresh squeezed orange juice from my neighborhood cafe than buy a frozen concentrate to mix at home. Less processing is simply a shopping mantra of mine. So when I read that ZICO has added another processing step to my beloved coconut water - it immediately hit me in the gut the wrong way. Regardless of the facts and figures about nutrients. I will say that your assurance that the nutrients stay in tact does clear up a big question mark for me - but I personally still prefer the less processed formula over the 'from concentrate' version. Last thing. As for the shipping ease of the new from concentrate formula - that's great! Better for the environment and I would imagine that this lowers ZICO's shipping costs greatly as well. I wish the cost savings would be passed onto the consumer. Most coconut water (of every brand) runs around $2 a drink - not exactly accessible to all consumer price-points. I recommend coconut water to just about everyone I meet - and they often comment that it is too expensive to drink regularly. Again, thank you for the information - I will post it on my blog. I am a big fan of coconut water and ZICO has always been one of my top two favorite brands - simply delicious. Thus my intense interest in any brand changes. Your Turn! Now I'm curious... what do you guys think? Do you care? Are you sick of bloggers like me dissecting food brand news - or do you like being an informed consumer who holds companies fully accountable for their products? I'll admit I get a little frustrated by the lack of immediate transparency from some companies nowadays - but I was glad to get some direct facts from ZICO. OK, so maybe it's just a silly coconut beverage to some of you out there. But I think as consumers we have to stick up for brands we love and demand transparency. Just look at the extreme secrecy in the meat and dairy industries - corruption galore. Food is personal - lets keep it that way. Read my original post on ZICO's new packaging and formula here.